NGC has announced that American astronaut Clayton Anderson will individually autograph NGC certification labels. From 2007 to 2010, Anderson was a part of three Space Shuttle missions and two consecutive International Space Station expeditions. 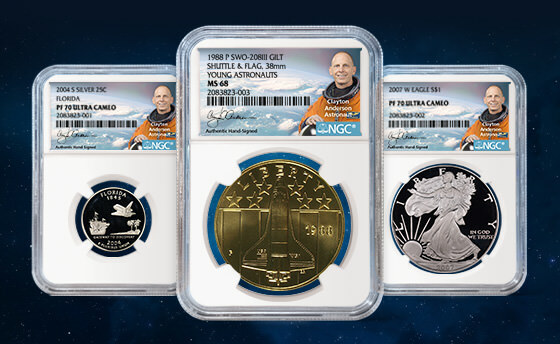 NGC Clayton Anderson Authentic Hand-Signed Labels are the perfect complement to any space- or Americana-themed numismatic item, including the 1971–1978 Eisenhower Dollar series (whose reverse shows an eagle landing on the moon to celebrate America’s achievements in space); the 2004 Florida State Quarter (whose reverse shows a NASA space shuttle); the 1988-P Young Astronauts Shuttle and Flag Medal; and the American Silver, Gold and Platinum Eagles.